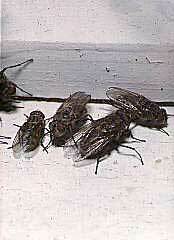 The cluster fly often moves indoors to hibernate and sleep through the winter. At Christmas, when you go up to fetch the Christmas decorations in the attic, a fly might wake up and start flying around inside the house. It is therefore called the ”Christmas fly”. The cluster fly is not related to the common housefly but is a kind of blowfly. It is larger and more hairy than the housefly and the larva is living as a parasite on earthworms. The scientific genus name for the cluster fly is Pollenia. Linnaeus never described the cluster fly even though they must have been abundant in his workroom. Instead his pupil Johan Fabricius in 1794 named the cluster fly. He called it Pollenia rudis. Fabricius, who became a famous entomologist (insect researcher), distinguished only one species. Today nine Pollenia species have been found in Sweden. The newest species was described in 1987. The cluster fly species are very similar to each other but can be told apart by details in their hairs. They all act in the same way and it has not been easy to separate the species. We will probably find even more cluster fly species in the future. Fly systematics is studied at Uppsala University.